Something all mosquitoes have in common is that the young forms are bound to water. Depending on the species, eggs are laid on the water surface, or eggs that are resistant to heat and dryness are deposited in spots where water is collected later as a result of floods or rain. A few species lay their eggs in tree holes or in small collections of water, others in ditches, small ponds, or cesspools, and others in large flood plains. Larvae hatch from the eggs, and in most species, they hang at the surface of the water, and breathe through a snorkel-like siphon on their abdomen. 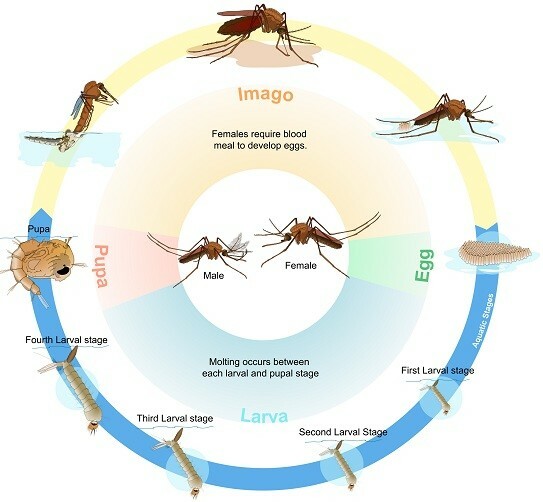 The life cycle of mosquitoes using the common house mosquito as an example. Diagram by Mariana Ruiz Villarreal, with kind permission. Malaria mosquitoes have larvae that hang horizontally below the water surface. All mosquito larvae breathe air. There are four larval stages that feed on organic material which they filter out of the water with their mouthparts. The fourth-stage larva changes into a so-called pupa, an animal resembling a comma that hangs at the surface of the water, and breathes air through two snorkel-like siphons at the front end. Pupae do not eat, because the larva changes into an adult insect, or imago, inside the pupa. Only female mosquitoes feed on blood, which they need to produce their eggs. They normally lick up sweet plant juices and nectar to meet their energy requirement. Male mosquitoes have an exclusively vegetarian diet; their mandibles are not suited for stinging. Male mosquitoes can be identified by their bushy antennae. Due to their structure, the buzzing of the female’s wings causes them to vibrate. That is how the males recognize their mates.